Home > Solar Inverters > Solar Inverter Sizing: Don’t violate the new CEC guidelines! Solar Inverter Sizing: Don’t violate the new CEC guidelines! How many panels can you connect to your inverter? It is common practice, when designing a solar system, to ‘undersize’ the solar inverter, by connecting more panels than the inverter appears to be rated for. This can freak out some solar customers when they see, for example 3.25kW of panels proposed to be connected to a 3kW inverter in their solar quote. A typical solar inverter sold as “a 3kW inverter” can usually have more than 3kW of solar panels safely connected to it, because 3kW of panels never actually produces 3kW of power for the reasons outlined here. However, new CEC guidelines, effective from Feb 2013 are much more stringent about how many ‘extra’ panels you are now allowed to connect to an inverter, and it seems that some installers have not picked up on the new rules! My solar installer has explained in detail that a 3kW system would suit my needs. I only have one concern before I go ahead. They have quoted 12 x 250w Daqo Panels & a Motech 2500-AU inverter. I believe this is only a 2.5kW inverter. Could you advise if this is sufficient. b) it shall not be outside the inverter manufacturers max input power specifications. a) Array peak power = the rated output of all the panels = 250W x 12 = 3000W. Nominal output power (from the spec sheet ) is 2500W. 2500/3000 x 100% = 83%. So the inverter’s nominal AC output is 83% of the panel array size, which is more than 75%, Cool bananas! We’ve passed the first hurdle. b) Inverter’s “DC Max input power”( from the spec sheet ) is 2900W. Oh dear! This is a no-no. We can’t have more than 2900W of panels, and the installer wants to connect 3000W. This is not allowed under the guidelines. So my answer to Ian is: No. The inverter is not sufficient for 3000W of panels. Please go back to your installer and ask him to look at his design again. Finn, I first came across an article by you in the Sydney Morning Herald and have been following you since via your name and want to congratulate you on the service you are providing. I am installing a Samil 4500TL-D inverter (4.23 kW) with 18 x 235W Trina polycrystalline panels in the Buderim QLD area through Energy Australia. Following your advice I contacted Energy Australia today to obtain the cost of extending the inverter warranty by an extra 5 years and was told $344 and was wondering if this is about right or a little over the odds. Hi Ian, seems a little steep. Last time I checked it was closer to $200. Cost of a new inverter plus installation in 5 years will probably be about 900 bucks – but inverters are the most likely component to fail – so your call! If the inverter is likely to fail, would it be feasible to install an inverter greater than the rated output of the solar panels or is inverter failure the result of other factors? Yes, I think the main reason for failure is they load up the invertor near to its maximum. Mainly for cheapness to maximise their profits(a miniscule small percentage gain in efficiency is there, verse a 500 hundred dollars dearer invertor) as the rebate system doesnt care about the invertor capability. Hence this practise to use under rated invertors. 3) look at the geometry of your roof. A reputable company has to use a CEC accredited designer who will provide you a signed design document with the calcs to prove that this combination will work in your part of Australia and how much power it will deliver. Mine was designed by Solashop in Victoria and apart from the Co. going bust it seems to be a good setup. There was no diference in the install price but my inverter is now located at the back of the house. I’m going to assume that you’re pushing a (theoretical) maximum of 30A and 150v out of your panels, so given you’ve got 8awg wire installed (or similar), on a 20m run of cable you’re expect about ~2.5% losses, double it to 40m and you’ve got ~5.1% losses. Calculate that over a year (in %) to see what sort of dollars you’d potentially loose. I’d personally just install a higher gauge wire to minimise losses over the additional distance and place the inverter in a spot where it wasn’t an eyesore. 8awg wire rated to 60A (for instance) is going to cost you all of about $3/metre at most and will roughly half those losses over distance. The guy that installed the inverter was being cheap or didn’t want to go out and get a larger gauge wire or install multiple cable runs in parallel. As long as you dont exceed the DC input voltage and the input current, youre fine. There is no maximum DC power input that refers to a maximum panel peak output capacity, that max DC power figure is the maximum the inverter can use at any one time. The inverter is a load to the solar panels, meaning it is only going to consume the power from them it is capable of drawing, the panels themselves are like batteries, they ONLY flow current proportional to the connected load. 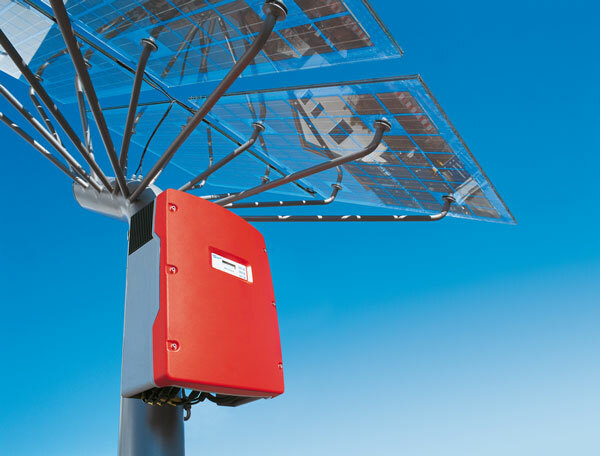 The inverter is not capable of providing more load to the connected array simply because the ability to supply current is there. Dual MPPT SMAs can be loaded beyond 400% in some cases ( the 3000TL-21 for example ) and run perfectly happy for a very long time. Although that is an overkill, it can indeed be done. Systems with east-north-west tri-dirrectional arrays can easily put out maximum output from early morning to late afternoon with a 180% over sizing. I know the CEC guidelines no longer like this, however they are out of touch with the operational concept of electricity if they believe it is for efficiency. The array rating of 3000Wp (watts peak) refers to cell temperature of 25 degrees centigrade, at 100 watts per square meter insolation and certain atmospheric pressure (1atm from memory). I’m going out on a limb here and saying you will NEVER get these conditions in real life, hence your 3000Wp array will never actually produce this amount. Even if it does, the inverter will simply current limit the output, and providing your array voltage is within limits no harm will be done to the inverter. What idiots we have governing the solar industry and giving advice to the public. I don’t agree with some of the CEC guidelines either. But them’s the rules of the game! A CEC Accredited installer is duty bound to follow the guidelines. The guidelines are there to protect consumers from buying underperforming systems, and the industry would be a nightmare without them. No they arent, if they were, we wouldnt see systems with split arrays on one series string, we wouldnt see panels installed in mostly shade, and we wouldnt see panels installed facing in any southern direction. I know what they “claim” CEC guidelines are for, but to consider oversized arrays could ever underperform is a joke in every sense of the word. They are made up by people with what certainly apears to be very little practical knowledge of either solar systems, and electrical knowledge in general. The fact they have clearly subscribed to the ‘solar panels push out a given wattage’ theory is proof of that. No power source pushes anything other than a voltage out, and it requires a load ( or at least a complete circuit ) for current to flow. Inverter is load to the panels, and it will only draw from them the current required to do its job. It is not electrically possible for it to receive more current than load permits. I would never oversize if there was no limit on inverter output capacity, but there is, so i do. My aim is to have the inverter sitting at or near its maximum output for as much of the day as possible, not peaking under capacity at mid day and making marginal outputs when power is more likely to be required. That is efficient system design!! Hi, I have 16 panels and a 3kw Samil inverter that has just died.. I got a quote for a new European made 3kw inverter (not sure which brand) for 1800 bucks installed. Seems steep to me? Also, would I be better off going for a 4kw inverter with 16 panels?? Depending on your location and your current Feed In Tariff – you have to be careful. If you increase the size of the inverter you may lose your FiT – as you probably only have permission for 3kW. A good, local installer will be all over the issues. Also – if you upgrade the inverter you generally need to upgrade the installation to the latest Australian standard – which may add to the price. As a guide the wholesale price of a top-of-the-range SMA 3kW inverter is $1,475.00 + GST, and for a budget 3kW inverter (Growatt) is $800+GST. Hi, I am trying to replace a second failed inverter (which was under warranty but the installer fails to answer calls and has removed website). I’ve got the specs for the old one and am trying to approx. match those when choosing a new one. How important is the ‘max input current’? Our old one says 18A, but a new one I’m looking at says 10A. We have 2Kw of panels and the inverter I’m looking at is 3kw. All other specs seem OK, eg max input voltage, MPP voltage range, initial input voltage etc. Max input current is very important as is the voltage window. Then click on the button for a repair quote – we’ll organise a quote for a new inverter from someone we trust. I have a 3KW inverter with only 1.5kw of solar panels. I got an upgrade on a new build because they ran out of 1.5kw inverters. I am now looking to beef up the system and either install new panels to maximize power production or go to a larger 5KW system. I have been researching what the largest system you can put on your home and still maintain the feed in tariff but cant seem to track that down online. I feel the largest system is 5KW for Queensland, is that right? The QLD rules are that if you upgrade your inverter size, you lose the 44c FiT. But you can add panels to an existing inverter (up to 133% of the inverter max power rating) and not lose any FiT. So technically, if your distributor finds out you’ve got a bigger inverter they could kill your FiT. Hi I’m looking to install a 250watt solar panels on my campervan and was wondering if a 3000W inverter was too much..? I’m gonna be plugin a laptop and a portable air con on it too.. thanks for the help! Hi, I’m installing 12, 250Watt panels (3kw) to my Samil 3.3kw inverter. My question is what kind of wire rating must I use to run 15m from panels to inverter…. and from inverter to house fuse box (also 15m) ?? I realise former transports is DC – latter AC. Your advice/help is much appreciated. Would the design by sufficient if the MPPT arrangement over north/west config? So 1.5kW North / 1.5kW West. Since I wrote this post the CEC have relaxed the 2nd part of the guidelines about the ‘max DC input power’. The bit that is enforced is the 75% rule. So today, a 3kW inverter can have up to 4kW of panels attached to it and not violate the guidelines. Finn, if that is the case can you amend the above? Ive overloadad my panel array and on reading the advice above i na link from one of your other posts panicked like mad! I had to read all these responses to get down to here to find that overloading my inverter by 135% is fine! Also my inverter gives its input in volts not watts? My house has 3 Phase power with the possible load spread evenly over the Phases. However I know that when it comes down to actual load, things will be all over the place. The double wall oven that is on Phase 1 will be on and sucking 5000watts out of the system while the air-conditioners that are on Phase 2 will be off because it is winter and the heat from the oven is more than welcome. So what happens with the 7kw from my proposed PV installation. Can the system be set up so that the output from the PVs goes to firstly cover demand on say Phase 1 and then any and all surplus be diverted/cascaded to Phase 2 and so on cascaded to Phase 3 before whatever is left over is sent to the grid? I have been told this is possible – but how? If the output from the PVs is split evenly to cover load on each of the 3 Phases then there would only be 2333 watts of the 7000 produced to cover the oven use and the remaining 4666 watts would be fed back into the grid while at the same time 2666 watts would be pulled from the grid to keep the oven running. Is it is possible to cascade from one Phase to the next with surplus energy? Single Phase, no doubt, would have made life much simpler. What is your advice re this issue. Hello Rudi, Ronald here. If your 7 kilowatt solar system has a 3 phase inverter then the output of the solar system will be evenly distributed across the three phases. So if your oven on phase 1 is drawing 5 kilowatts and the other 2 phases are drawing nothing while your solar system is producing 6 kilowatts, then what will happen is phase 1 will draw 3 kilowatts from the grid and 2 kilowatts from the solar system to power the oven, while the other phases will each export 2 kilowatts of power to the grid. This is not a problem for the household as the electricity meter should only care about the net amount of electricity being consumed or exported by the household. So with the previous example, the meter would regard the house as using no grid electricity and exporting 1 kilowatt, even though 3 kilowatts of grid electricity were being imported on one phase and two kilowatts were being exported on the other phases. If your solar system has a single phase inverter than it will be attached to which ever phase your installer believes will draw the most power during the day. While it should be technically possible to set up a system so a solar system supplies power to which ever phase needs it, I don’t see any advantage to the household by doing that. It would be an extra expense for no benefit. Thankyou for your prompt reply. The proposal is for a three phase inverter or possibly micro inverters. In Paragraph 2 you say “the electricity meter should only care about the net amount of electricity consumed”. We have 3 separate meters. The third is an EM1200 which looks after the general power as well as the reduced tariff hot-water on Phase 2. I don’t believe these 3 meters communicate with each other. Would we need to get ONE smart meter which meters all 3 Phases for it to work out the net consumption less production across the 3 Phases? Of course if our electricity supplier were prepared to bill us at the end of the month by adding up the total consumption across the 3 meters and subtracting the production, I would be over the moon, but some how I can’t see that happening as it would benefit me too greatly. I can only dream. Also do you have a rough idea how much such a meter swap would cost? When your solar system is installed an import/export meter will be put in that will keep track of the net amount of electricity that goes in and out of the home. It is also likely you will get a smart meter installed as well, as these are being gradually phased in across Australia. The cost of a new meter will depend on where you are. Electricity retailers may offer to install “free” smart meters but they may flat out lie and charge a monthly fee for them and the smart meter can be locked to that particular retailer. It can pay to be very careful about what’s on offer. Hey Finn, thanks for this website. I’m still trying to get my head around all this information. Some of these things are just way over my head. I’ve received a quote for the following systems and would like to know your thoughts on it. I’ve got huge gumtrees near the property. So micro-inverters have been suggested as the preferred option. I’m still getting quotes from other companies. But would like to know your thoughts on these intial quotes. My bill currently shows an average of 21-22 kWh in daily usage. I don’t know your location, so I can’t know how many kilowatt-hours you could expect your system to generate without shade. The rule of thumb is around 4 kilowatt-hours a day per kilowatt of panels in most of Australia, more in central and north Australia and around 3.5 in Melbourne. According to your information, with either system you’ll be getting an average of around 3.5 kilowatt-hours a day per kilowatt-hour of solar panels. If that figure takes into account the shade from surrounding trees, then that’s not too bad. If your roof has a considerable amount of shading then microinverters might result in around 15% greater electricity output than a standard string inverter. I think the high reliability of Enphase microinverters makes paying a considerable premium for them worthwhile, but it is also reasonable to decided to go for a cheaper string inverter system if you don’t think the increase in electricity output and high reliability is worthwhile. If you decide to get a string inverter, SMA and Fronius are two reliable brands and currently Fronius comes with a 10 year warranty. As you are currently using an average of 21-22 kilowatt-hours a day, either of the systems above should take a big chunk out of your electricity bills. Just how much will depend on if there are people at home during the day using the solar electricity instead of grid power, rather than most of it being sent into the grid for a feed-in tariff. Hi all, awesome website, learning heaps. Has anyone heard of or had experience with flextronic solar panels. Have been advised they are tier 1 but they don’t appear on the tier 1 list. Also, how do the Stc s change so much between different quotes of same size. Have differences of hundreds of dollars. As far as I am aware, Flextronic panels are not normally considered to be tier one. The little I know about the panels is good and so, based on what I have heard, I would expect them to be reliable. STCs can vary in price over time and there can be variation in what is charged for processing them. If the difference is very large then an installer may not be calculating their worth properly. But what matters to the customer is the final price for a system. Thanks for the advice, I find myself very uninformed when it comes to this and lean on advice from the sales person. Maybe my first mistake. But he did advise that flextronic are made to same standard as tier 1 panels, and suggested they are a far better product than ET branded ones I was considering? I was told the degradation rate is less and the panels are normally utilised in large scale utility grade sites. Also, topped it of with a performance guarantee? Price is not overly more expensive (800) than similar systems with ET or Trina panels and same fronius inverter, slightly larger though. Appreciate your thoughts on this. I’m afraid I don’t have enough information to say if they are better or worse than panels such as ET Solar. But I would expect panels made by Flextronics to be of good quality. After all, they made my original xbox and it still works. If you know the specific name of the panels I can look up their datasheet and tell you if anything about them stands out. If you want to compare warranties, last time I checked, ET Solar had a 10 year product warranty and a 25 year performance warranty. If Flextronics (or Flex as they are now called) offer a longer warranty than that in Australia, then it doesn’t necessary mean they are better, but it is a good sign. The brochure they forwarded me is the sunedison F series 255w-275 w which comes up on dr google. Although it is sunedison, salesman stated they are made by flex anyway, and that the specs will be the same with the 260w panel. Really do appreciate your time on this and if I could buy you a virtual beer I would. As far as I am aware, Flex makes all the panel with SunEdison’s name on them. Looking at their datasheet, I see nothing bad. Their temperature coefficient of Pmax is a little high, but it is almost the same as that of ET panels, so I wouldn’t worry about it. I see that in the United States their product and performance warranties are both 25 years. That’s good, but Australian Consumer Law is stronger, so it’s not surprising their product warranty is less here. I’ve just had 6.72kW of solar panels installed. They have installed a Solax-X1 Hybrid ready inverter with max D.C. power input at 5000 W and nominal AC output @ 4600W. With 6.72 kilowatts of panels you are over the limit of 6.13 kilowatts of panels that would normally apply with a 4.6 kilowatt inverter, so you were lucky you were able to have that approved. If you have 6.72 kilowatts of panels, then I would expect you to be producing around 4.6 kilowatts with a 4.6 kilowatt inverter under good conditions. I suggest keeping making notes of times and output on a clear day or days and then contacting your installer about it. I’d also check that you do have 6.72 kilowatts of panels. We have installed a new solar system in melbourne. 20 x 290w black max gen 5 panels. We were quoted for 20 x s270 enphase microinverters. Bill arrived and it says 20 xs230 micro inverters installed. We are waiting for them to clarify if this is a typo or not. Wondering what your thoughts are on this situation if it turns out they have installed the smaller micro inverters. Might be ok …but if not…should we expect them to reinstall s270 or ask for a discount?? But you definitely should receive what you have paid for and if you do have s230 inverters then you definitely should receive a refund in the difference in price between the two systems. If you didn’t receive what you paid for you can require them to replace the inverters with s270 ones, but that won’t be of much benefit to you so I’d suggest seeking a refund of the difference between the two types of systems. Hi Finn. Also we tried to read the micro inverters to see what size they are but its not visible. Easy way to identify for ourselves what is actually on our roof??? Thanks for your very informative website. just found your site with lots of good info, thanks. I recently installed a 6.6 kw system (22 panels x 300kw) split into 2 arrays with 14 panels facing north, north east and 8 panels facing north west. we did this to maximise the amount of sun during the full day. It’s all hooked up to a Zeversolution 5000 single phase invertor. With the split array I assume I will never get more than around 4.9 kw as all 22 panels will never get the same amount of sun on them at the same time and with the limitations of the invertor. Most of the time I’d definitely expect you to get under 5 kilowatts but I would still expect you to generate a little over 5 kilowatts under good conditions when the sun is in the right position. You new electricity meter will only measure you net electricity consumption. So if you are drawing 1 kilowatt of grid electricity on one phase, 2 kilowatts of grid electricity on another phase, and exporting 2 kilowatts of solar electricity on the third phase, as far as your meter is concerned you are only using 1 kilowatt of grid electricity at that time. If you were instead exporting 4 kilowatts of solar electricity your meter would regard you as using no grid electricity and exporting 1 kilowatt to the grid. I really don’t get it. An inverter is like a switched power supply. As long as you don’t exceed the max input voltage, you can connect as much panels as you want in a serial/parallel configuration! The inverter will work at max power longer and that might shorten it’s life span a bit, but the return will outweigh that for sure. The extra generated energy is just lost. So if you are limited in inverter power like Australia, you can connect as many panels as you want. It will start generating sooner and top off when reaching max output power and flat line at that level. I’m an electrical engineer btw. It is necessary to stay within the guidelines in order to receive our Small-scale Renewable Energy Scheme subsidy or “solar rebate” as it’s often called. If your high solar feed-in tariff ends in 2028 I am guessing you are in Queensland. 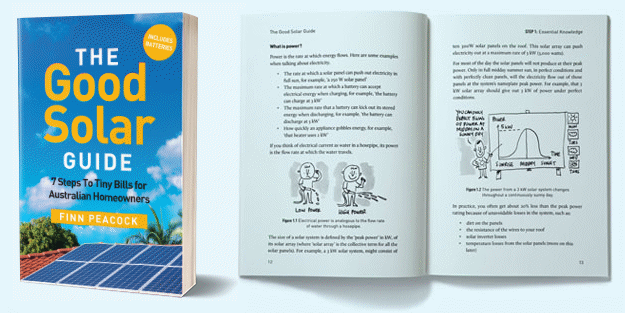 In Queensland, if you want to retain your high feed-in tariff your are not permitted to increase your solar panel capacity above what it was when the system was originally installed. So if you originally had 2 kilowatts of panels, which is the maximum for a 1.5 kilowatt inverter, you are not allowed to have more than that. So if Origin is saying you can have 9 panels they are probably referring to panels that have low wattage by today’s standards. For example nine 200 watt panels will come to 1.8 kilowatts. But if you have seven 250 watt panels will come to 1.75 kilowatts. So the number of panels you can have will depend on their size. Congratulations on a great site and a terrific service (quotes obtained). Just wading through some offers for systems with some differences as follows. 3) 4.2 kW 14 Solar Edge 300 panels with Solar Edge SE4000H inverters/optimisers. Systems 1) and 3) are within $500 of each other, whilst System 2 is understandably is $800 – $1300 more. Questions – any preferences with any of these system? Are Solar Edge products well known and supported. Would LG panels or similar with 25 yr product warranty be worth it. How much extra might that cost. Also the Fronius warranty periods seem inconsistent, 5yrs, sometimes 5+5 years. Different! QCELLS are a good quality panel with a 12 year product warranty while Fronius is a good quality inverter. The Fronius warranty is a little confusing because it is given as 5 years full warranty where they will pay for a new unit and the cost of replacing it if required and then they have an extra 5 years in which they will provide a new inverter but not the labour cost. There is no problem putting a 325 watt panel on a 290 watt IQ7+ microinverter. Panels very rarely produce their full rated output so this isn’t really a problem. SolarEdge panels may be rebranded QCELLS panels or they may be another panel that has been given the SolarEdge brand. I would say SolarEdge is well supported in Australia, although I don’t know what the financial situation of the company is. Hopefully they will be around long term. Whether or not it is worthwhile paying extra for optimizers or micorinverters depends on how much shade your roof has. If there is no significant shade then they may increase output by around 3%. If there is severe shading they can increase output by up to 25% but I think that would only happen under exceptional circumstances. There is a good chance you will be better off spending the extra money on getting a larger solar system. For example, a 6.5 kilowatt solar system — assuming there is enough room on your roof. LG panels might add a couple thousand dollars to the cost of 4.55 kilowatt system. We currently use around 9 kWh daily across all four quarters of the year, so the larger system would still be warranted? Your electricity consumption is below average, but for most people with your consumption it will be worthwhile to get a larger system with a 5 kilowatt inverter and close to the maximum solar panel capacity of 6.66 kilowatts. If you get a system that is 2 kilowatts larger than what you are planning it might produce around 8 extra kilowatt-hours a day. Even if you send all the extra electricity produced into the grid, even if your feed-in tariff is only 10 cents that will still earn you around $290 a year. If the larger system costs you an extra $1,500 they will pay for themselves in around 5 years. As you will be using a portion of the power they produce the actual results will be a little better. Yeah thanks Ronald. I’ve taken up the option of a 5.2kW system which still has a good ROI, payback and savings/annum which should be ok, and not too exxy. Many thanks for your help and the great site.